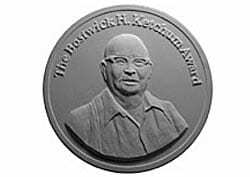 The Ketchum Award was established in 1983 to honor an internationally recognized scientist who demonstrates an innovative approach to coastal research, leadership in the scientific community, and who provides a link between coastal research and societal issues. The 15th award was presented to Dr. James E. Cloern, United States Geological Survey, on April 28, 2010 at a ceremony in the Redfield Laboratory Auditorium, and followed by a reception at the WHOI Exhibit Center, in Woods Hole Village. The award is administered by the WHOI Coastal Ocean Institute and Rinehart Coastal Research Center. hy and his appreciation for the interconnectedness of marine phenomena are evident in more than 70 papers he authored on subjects ranging from estuarine physics to deep ocean biology. Buck Ketchum's early research provided a basis for our understanding of productivity of the oceans. In later years, he turned his attention to the effects of man's activities in the coastal zone. Buck's commitment to translating research results into useful information for policymakers and resource managers was exemplified by his organization of a national conference on critical problems of the Coastal Zone. The conference and its proceedings, The water's edge: critical problems of the Coastal Zone (MIT Press, 1972), are widely credited with maintaining the momentum and focusing the direction of present national coastal zone management policy. This scholarly review contributed to the development of Coastal Zone Management Act and formed the rationale for WHOI's establishment of the Coastal Research Center. Buck passed away in 1982. 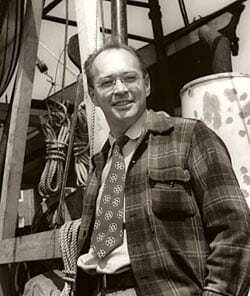 At the time of his death, he was one of four co-authors of a six-volume series entitled Wastes in the Oceans (John Wiley & Sons). The first volume was dedicated to Dr. Ketchum, "who, until his death, had worked for and believed in the immortality of humanity and science."